Scrapbook, circa 1910. Cut-out gelatin silver print on paper. 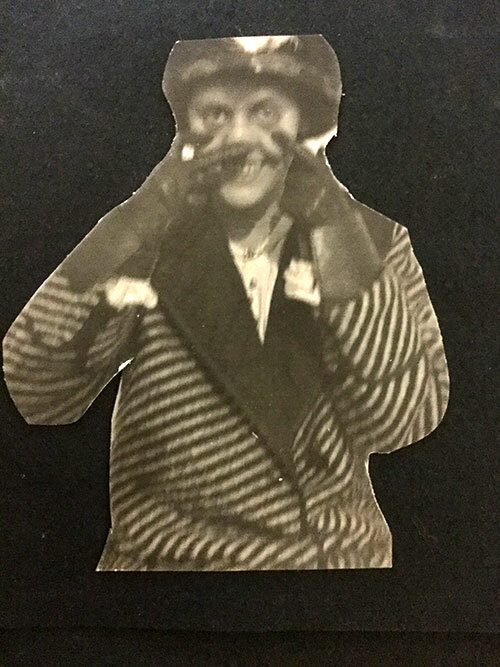 The unidentified photographer of this image, likely a niece of Augustus Moulton (Bowdoin 1873), filled her scrapbook with quirky cut-out images. The photographs were printed on silver gelatin paper and taken with a handheld camera, then a relatively new invention whose inexpensiveness allowed for a democratization of photography. The intimacy and unguardedness of the photographs indicate they were not meant for public consumption, but for personal viewing, and they speak to inside jokes and close friendship. The intimacy of the handheld camera, along with its portability and low cost, creates in this scrapbook representations of women unrestricted by notions of what is or isn’t worthy of being photographed. From the Augustus Freedom Moulton Papers. William Pierce’s Class of 1871 Call to Prayers, 1871. Stereograph. 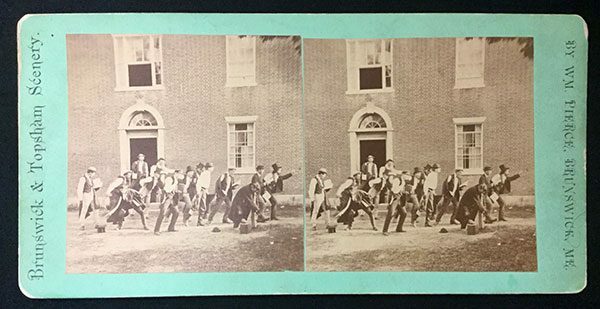 This stereographic image depicts a group of Bowdoin students of the class of 1871 outside of Winthrop Hall going to prayers. Chapel attendance was still mandatory at Bowdoin in 1871. By exaggerating typical walking movements and collectively tilting towards the right, the students add an element of comedy to one of their daily activities. The drama of this photograph would have been heightened because it is a stereograph, an early form of three-dimensional photography. Placed on cardboard were two almost identical photographs, side by side, to be viewed with a stereoscope. When viewed through a stereoscope, the photograph appeared three-dimensional, creating a compelling visual illusion for the viewer. From the Bowdoin College Archives. 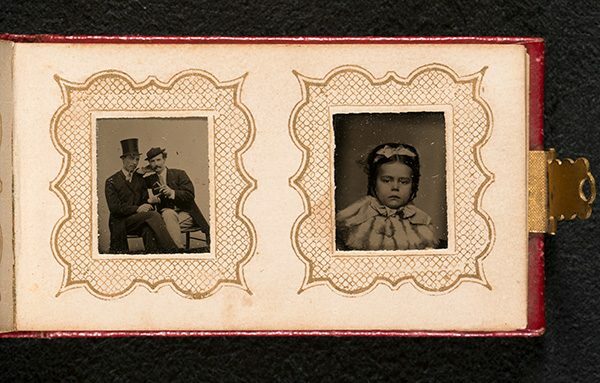 Tintype miniature photo album, circa 1881. This photo album from the Rowland Bailey Howard Papers captures the essence of intimate viewing of photography that characterized early photographs. The size of the object allows one to hold it in two hands and forces one to look closely at each image. One can imagine sitting in a chair, looking at the photos of loved ones and associating memories with each person. The red leather and adornment of the album also add to its aesthetic value and suggest it contains important content. From the Rowland Bailey Howard Papers.